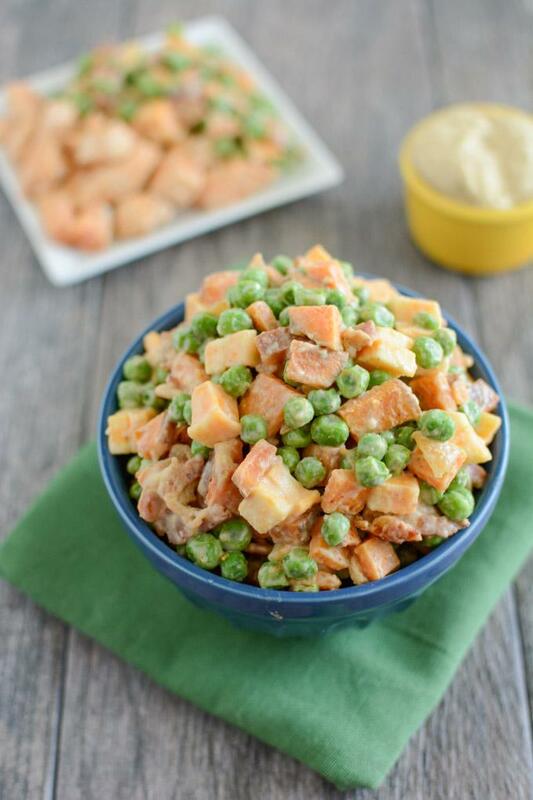 This Pea Salad with Sweet Potatoes is a healthy, kid-friendly recipe the whole family will love for dinner. Covered in hummus and mixed with bacon and cheese, what’s not to love about this side dish? This month we’re back to focusing on a specific ingredient: green peas! I always have a bag or two of peas in my freezer and I actually think they are kind of an underrated veggie. They’ve got their fair share of protein, are easy to cook and have a sweet taste. Most days, Squish will even eat them straight from the bowl with a spoon! So hopefully after seeing these recipes you’ll give them a fair shot if you haven’t already. Although Squish will often eat them plain, there are days when we won’t touch them. So I made this recipe with him in mind. 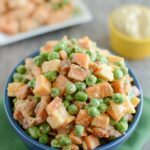 To be honest, I didn’t even know that pea salad was a thing until a couple weeks ago….but after looking at several recipes trying to get some inspiration, I basically just started with peas, threw in a bunch of other things he likes (bacon, cheese, sweet potatoes) and covered it all in hummus (his favorite)! This salad would be a great side dish to bring to a summer cookout. You can eat it cold or room temperature and it comes together pretty quickly! Cook peas according to package directions and let cool. Meanwhile, saute bacon, onion and sweet potato in a skillet until sweet potatoes reach desired level of doneness. Let cool. 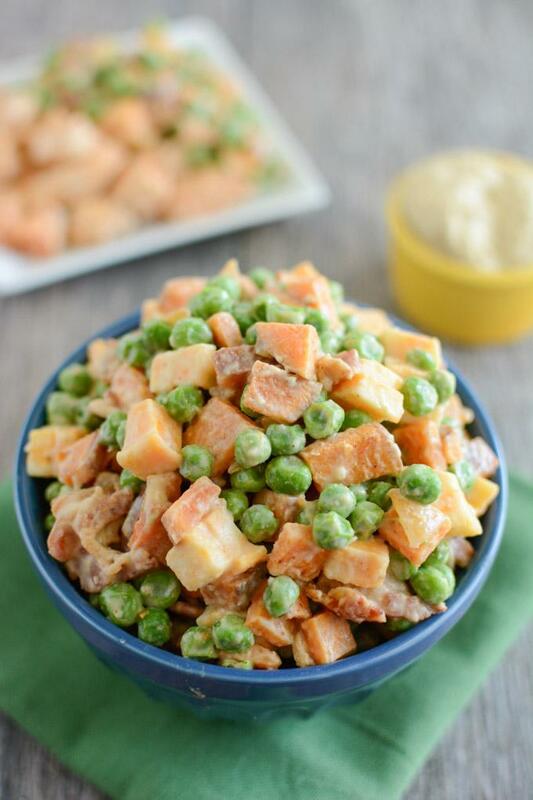 Combine peas, sweet potato mixture and cheese cubes in a large bowl. In a small bowl add water to hummus and mix well to thin it out. Spoon over pea mixture and stir until well coated. *To cook the sweet potatoes faster, toss in oil and microwave for 1-2 minutes before adding to pan. Or use leftover roasted sweet potatoes. Like I mentioned, I sauteed my sweet potatoes but I’ve since made it again with leftover roasted sweet potatoes and loved it. To cook the sweet potatoes faster, toss them in a little oil and microwave them for 1-2 minutes before you add them to the pan. 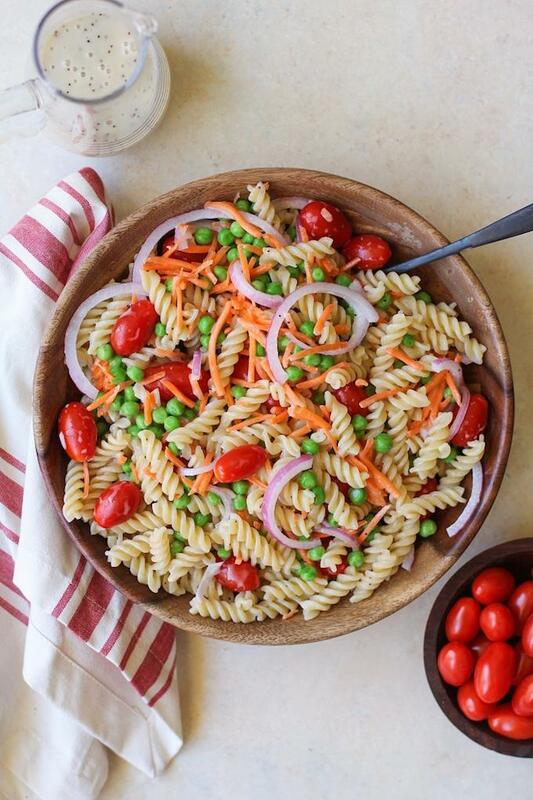 This pasta salad would be perfect for a summer cookout! This looks like the perfect dinner side dish! 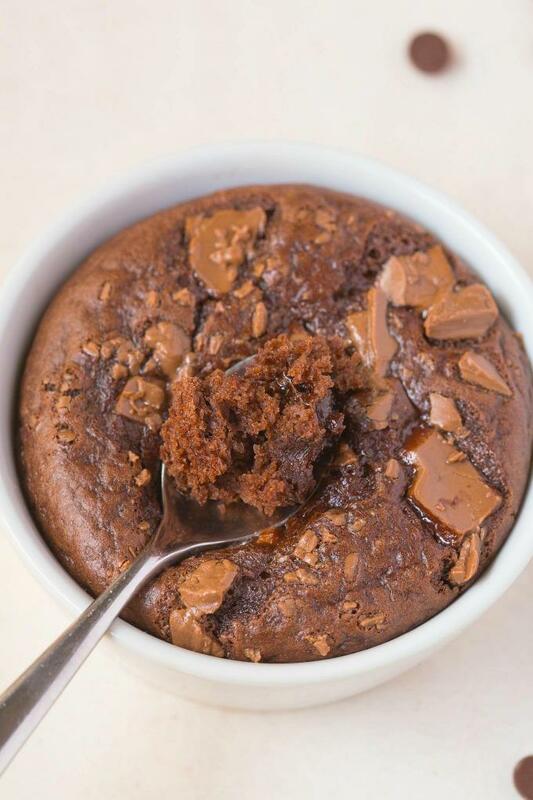 Veggies in one minute brownies? Pure genius. 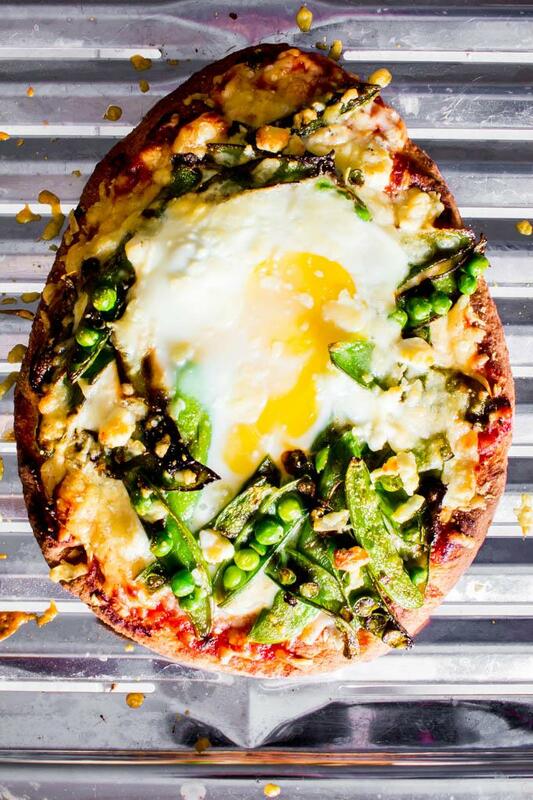 Peas on pizza? Yes puhleez! 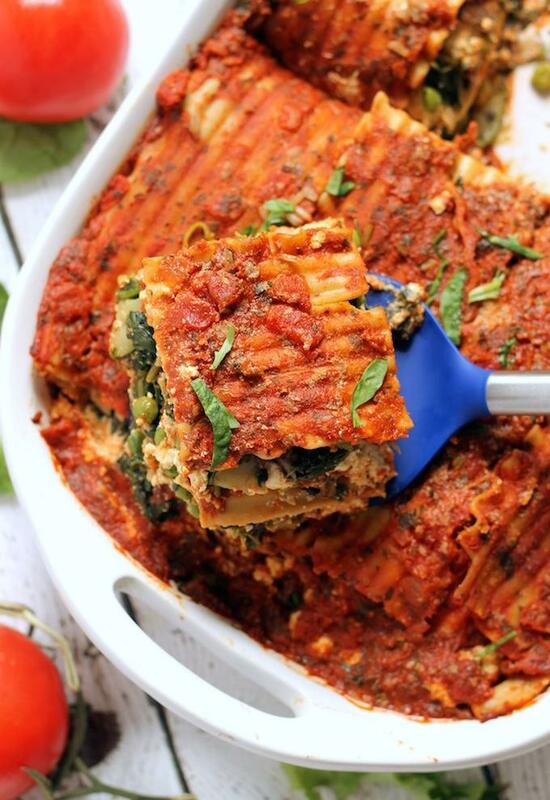 Light and fresh lasagna, perfect for summer! 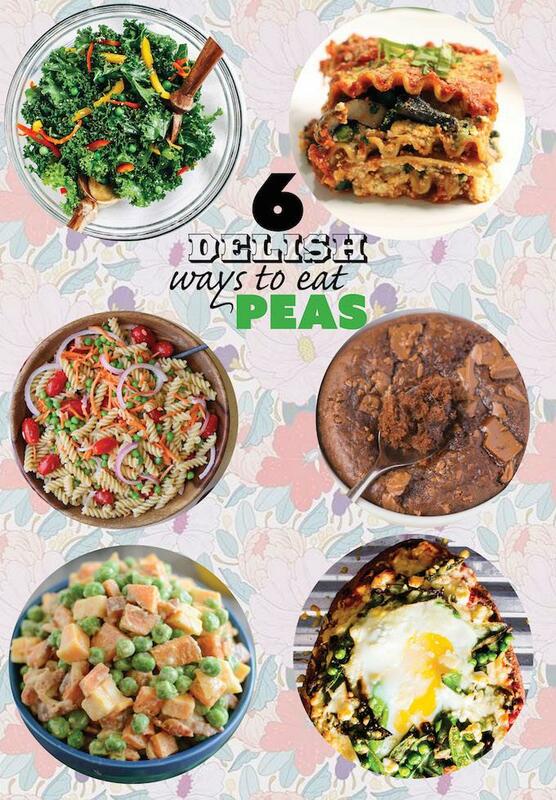 Wow I never knew peas could be eaten so many ways! Great round up! Wow I dont give much thought to peas…guess I need to start incorporating them more! Thanks for sharing all of these great items! Heck yes, I’m loving all the flavorful ingredients in this potato salad! Sweet potatoes are always my choice when making potato salad and I’m loving the bacon + hummus dressing. I’d definitely whip this up for my next family gathering! I occasionally buy snap peas to snack on, but pretty much never eat peas otherwise – no idea why, but that’s going to change so I can try out all these recipes! I NEEEEEEEEEED to make this right away! We’re going through a bit of a “pea phase” at the moment and loving anything with peas! 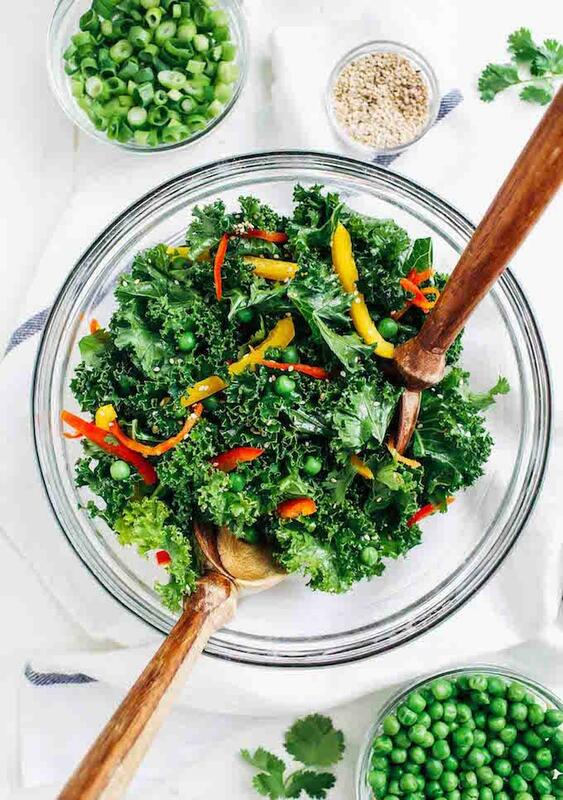 Just make this salad today for lunch. Rave reviews! Have leftovers so we’ll get to enjoy it tomorow too!… it great. very good. thanks.